One of the biggest health challenges for millions of Americans is how to cut back on the sugar in their diets. But cutting back on candy and other sweets is only part of the battle. Sugar is hidden in so many foods that the average American consumes 160 pounds of the stuff each year. Registered dietician Keri Glassman visited The Early Show to flag some of the ways sugar sneaks into American diets and suggest alternatives. 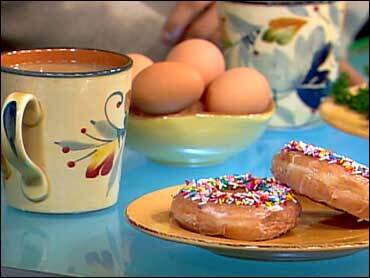 "In truth, everything breaks down to sugar in our body,"
co-anchor Rene Syler. "It's just that we're over-eating it to such an excess." One of Glassman's first suggestions is to take a close look at the usual breakfast routines. The morning donuts should be the first thing to go. "A little bit of protein is much better for you in the morning because it will create satiety," she said. "It will hold you over and really provide you with satisfaction until your snack or lunch." Foods that seem safe very often list high fructose corn syrup in their ingredients and that should be a red flag. And look out for condiments like ketchup and syrup. They can be loaded with sugar. For a healthy and satisfying snack, Glassman likes crackers and natural peanut butter, with no added sugar. "It's going to provide some fiber to keep you full as well as some healthy fat and protein to provide satiety," she said. Glassman suggests starting each meal with a salad with vinaigrette dressing. The greens provide important fiber and the fat in the dressing makes people feel full so they do not overeat during the rest of the meal. And it's always a good idea to think twice before grabbing one of those high energy protein bars. Some have up to 300 calories and plenty of sugar so Glassman says moderation is the key. "They're a great option when you can't have real food but you really want to make sure you're getting portion control," she advises. Portion control is also important with popular snacks like pretzels, once touted as a good low carb choice. "The big thing about pretzels is you can overeat them so dramatically," Glassman said. "You just keep digging your hand into the box and digging your hand into the box and all of a sudden you've eaten 400 calories and you're getting no nutrients and it's not providing satiety."